China’s ambiguous claim to the South China Sea, approximately demarcated by a series of hash marks known as the “nine-dashed line,” faced objections from an expanding number of parties over the past two weeks. While a challenge from the United States came from an unsurprising source, actions by Indonesia and Vietnam were unexpected in their tone and timing. On December 5th, the U.S. State Department released its analysis of the compatibility of China’s nine-dashed line with international law. 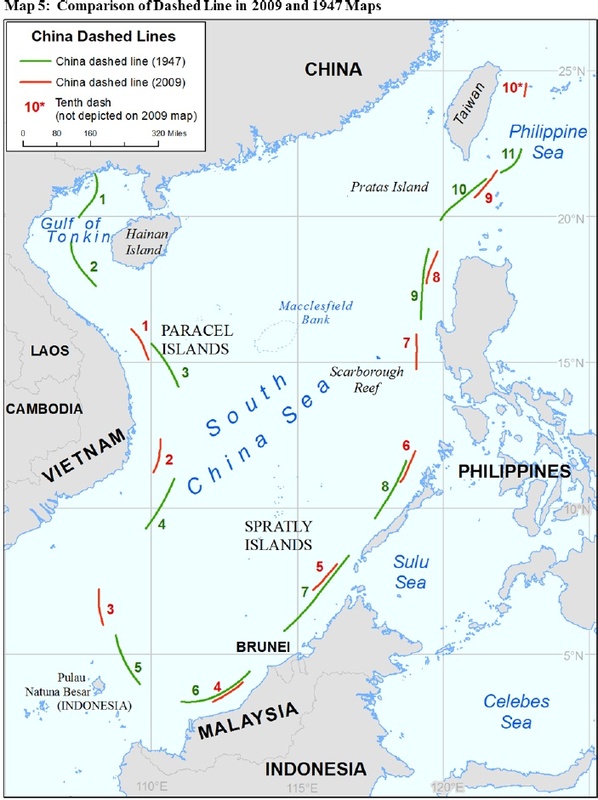 The report attempted to set aside the issue of sovereignty and explore “several possible interpretations of the dashed-line claim and the extent to which those interpretations are consistent with the international law of the sea.” The analysis found that as a demarcation of claims to land features within the line and their conferred maritime territory, the least expansive interpretation, the claim is consistent with international law but reiterated that ultimate sovereignty is subject to resolution with the other claimants. 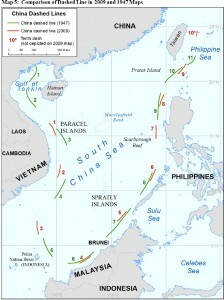 Although such analysis reflects prior U.S. policy positions, less expected were the pointed signals from Indonesia, which has built a reputation as a mediator among ASEAN states in dealing with China and striven to downplay the overlap by the nine-dashed line of its own claimed exclusive economic zone in the South China Sea from Natuna Island. On Tuesday at the think tank Center for Strategic and International Studies (CSIS) in Washington, senior Indonesian presidential advisor Luhut Binsar Panjaitan emphasized that the country was “very firm” that its “sovereignty cannot be negotiated,” while stressing the importance of dialogue to peacefully manage matters. Further, in response to a question from an audience member, Panjaitan stated (56:00 mark in the video below) that the development of gas fields offshore Natuna in cooperation with Chevron would “give a signal to China, ‘you cannot play a game here because of the presence of the U.S.’” Meanwhile Indonesian Maritime Affairs and Fisheries Minister Susi Pudjiastuti noted that after sinking Vietnamese vessels the Indonesian Navy said it had captured illegally fishing she was considering sinking 5 Thai and 22 Chinese vessels also caught. As Prashanth Parameswaran notes at The Diplomat, Indonesia is playing a balancing act – seeking at the same time to protect its sovereign interests as it attempts to align new president Joko Widodo (Jokowi)’s “Maritime Axis”/“Maritime Fulcrum” initiative with Xi Jinping’s “Maritime Silk Road” and play a leading role in China’s Asian Infrastructure Investment Bank. To some observers, sinking the Thai and Chinese boats is now necessary to preserve Indonesia’s image of impartiality, while others believe such action may be redundant if China heeds the warning that such behavior will no longer be tolerated. If the actions taken by the United States, Indonesia, and Vietnam were surprising, China’s reactions were not. On December 7th, China’s Ministry of Foreign Affairs released a white paper of its own on the Philippines’ arbitration case. 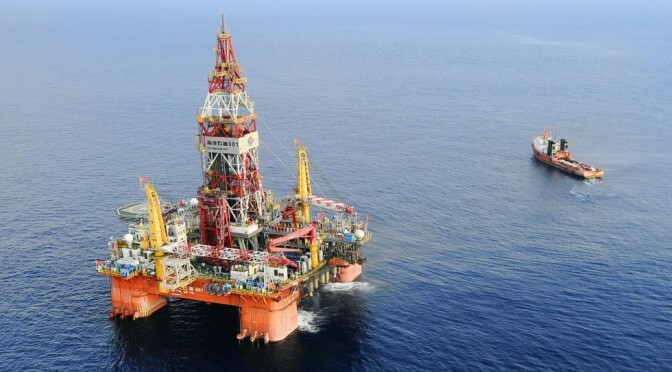 The document states that China’s policy, as established in its 2006 statement on UNCLOS ratification, is to exclude maritime delimitation from compulsory arbitration. Additionally, the paper says that while the current arbitration is ostensibly about the compatibility of China’s nine-dashed line with international law, “the essence of the subject-matter” deals with a mater of maritime delimitation and territorial sovereignty. The paper goes on to say that until the matter of sovereignty of the land features in the South China Sea is conclusively settled it is impossible to determine the extent to which China’s claims exceed international law. In effect, China is taking the position that only after it has conducted and conclude bilateral sovereignty negotiations will its nine-dashed line be open to critique. While the foreign ministry may be right that the Philippines is attempting to force the issue of territorial sovereignty, its argument that this prevents scrutiny of the nine-dashed line’s accordance with international law rings hollow. At the end of the day, China has repeatedly stated, and its new policy paper affirms, that it will “neither accept nor participate in the arbitration” initiated by the Philippines. Chinese Foreign Ministry Spokesman Hong Lei likewise remarked of Vietnam’s filing with the tribunal that “China will never accept such a claim.” So it is prudent to ask what benefit will come of the legal maneuvers. Some, such as Richard Javad Heydarian, a political-science professor at De La Salle University, point to the economic harm already incurred by the Philippines in opportunity costs and the danger of having created a worse domestic and international environment for settling the disputes. Yet given the lengthening list of states willing to stake a legal position on the matter and the moral weight of a potential court ruling, China can claim and attempt to enforce what it wants, but it will be increasingly clear that it is doing so in contravention of international law. Scott Cheney-Peters is a surface warfare officer in the U.S. Navy Reserve and the former editor of Surface Warfare magazine. He is the founder and president of the Center for International Maritime Security (CIMSEC), a graduate of Georgetown University and the U.S. Naval War College, and a member of the Truman National Security Project’s Defense Council. With a cold chill blowing through DC, it seems fitting to note several recent Arctic developments. Canada on Friday submitted a claim to the U.N. Commission on the Limits of the Continental Shelf that argues for an increased maritime share beyond its Exclusive Economic Zone of the (mostly) North Atlantic and Arctic, which would grant it rights to the resources contained therein on the seabed and is based on the nation’s view of the proper demarcation of the undersea continental shelves. Russia and Denmark are both expected to file overlapping claims with the commission. Current and expected claims beyond nations’ EEZs. While Friday was the “official” deadline for Canada, as it was 10 years after the nation signed the U.N. Convention on the Law of the Sea (UNCLOS), officials have said it will submit additional claims. Any such claims could extend to the North Pole once on-going scientific surveys have been completed to back the nation’s position (by treaty no country can claim sovereignty over the North Pole itself). 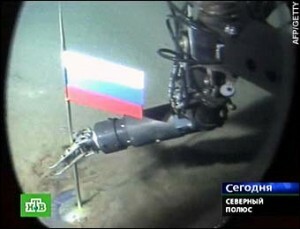 Russia filed in 2001, although it was subsequently been told it needs further scientific backing and officials have stated they face “no real deadline” to finalize their claims, which included the undersea Lomonosov Ridge, running from the East Siberian coast along the North Pole to Canada’s Ellesmere Island, thus creating the potential for conflict if the next set of Canadian claims includes the Lomonosov Ridge. Denmark’s claims, based on its possession of Greenland, are due in 2014, and could likewise overlap with Canada’s. Norway has already had its non-contentious filings validated. The United States, meanwhile as a non-signatory to UNCLOS, is ineligible to submit claims to the Commission but has sought to bilaterally negotiate its claims according to UNCLOS principles, notably with Canada. Russia announces formation of Arctic Group of Forces in 2014 with bases in Novosibirskiy Isl. and Franz Josef Isl. 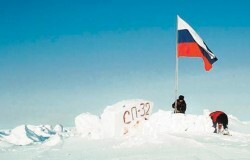 Russia plants flag at North Pole in 2007. No sign of Santa or Buddy the Elf. The BBC says that on Tuesday during a high-level meeting of Russian military leadership Putin commended the reopening of a previously closed high-Arctic airfield and reiterated the need to prioritize the Arctic, with a correspondent emphasizing that “this was one of his most direct orders yet.” The practical implications of the Arctic Group remains to be seen, and armed conflict is unlikely with announcements on both sides, as noted above mostly playing to domestic audiences. On the other hand, projections of increased shipping traffic and commercial activity in the north got a boost from the U.S. Department of Energy and U.S. Navy this week when findings of a joint research project predicted ice-free summers by 2016, decades earlier than most (but not all) conventional models have estimated (see here for the official U.S. Navy timeline to ice-free transit). If true, the rush to solidify coast guard and national security functions near Santa’s Workshop may prove warranted. The Arctic remains a region to keep an eye on. Who will keep the lights on? Around one hundred mostly African and South African expats and their approximately 800 Somali Marines of the Puntland Marine Police Force (PMPF) were left stranded with no cash for food, fuel or salaries. Back at the PMPF base, just west of Bosaso airport, there now sits millions of dollars in heavy construction equipment, fixed and rotary wing aircraft, ocean-going ships, RHIBs, heavy transport trucks and 4X4 vehicles that suddenly became idle. This calls into question the plateau in pirate attacks in the first half of the year from the north of the country, as gains on the ground might be reversed with a let up in pressure. According to Somalia Report‘s article, the decision may have come as a result of pressure from the UN which has been critical of the program. Read the full article for speculation on the program’s future. 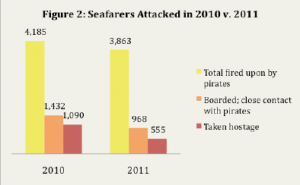 The report found that a total of 3,863 seafarers were fired upon by Somali pirates, down 8% from 2010. 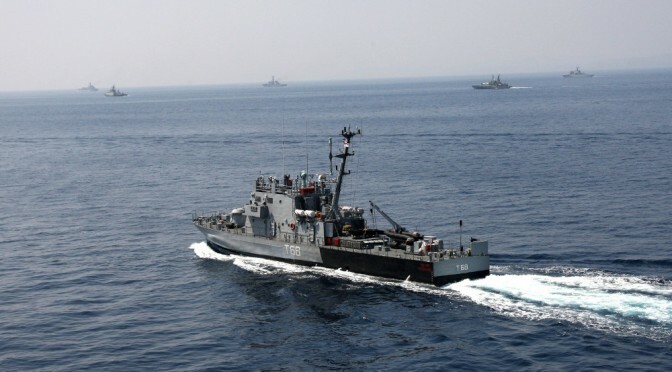 Of those, 968 came in close contact with armed pirates who were able to board their vessels and a total of 413 of them were rescued from citadels by naval forces. A standout number in the report was that the number of seafarers taken hostage in 2011 dropped by 50% with a total of 555, most likely driven by increased security measures taken by crews including the use of armed. In 2010 a total of 1,090 had been taken hostage. The report adds that a total of at least 1,206 hostages were held captive by Somali pirates in 2011, including the 555 seafarers who fell victim during 2011, 645 who were captured in 2010 and remained captive in 2011, and 6 tourists and aid workers kidnapped on land. The report estimates that the average length of captivity was over 8 months, up 50% over 2010. Tragically, 35 hostages died during 2011 including; 8 who were killed by pirates during an initial attack or after being taken captive; 8 died from disease or malnutrition while being held; and 19 died in crossfire while being used as human shields and during hostage rescue attempts. Another 3 hostages died after release as a result of abuse they had suffered while in captivity. In contrast, it is estimated that 111 pirates were killed in 2011 with 78 killed as a result of encounters with naval forces, 30 killed by fellow pirates, and 3 by Puntland police. LT Scott Cheney-Peters is a surface warfare officer in the U.S. Navy and the former editor of Surface Warfare magazine. He is the founding director of the Center for International Maritime Security and holds a master’s degree in National Security and Strategic Studies from the U.S. Naval War College.